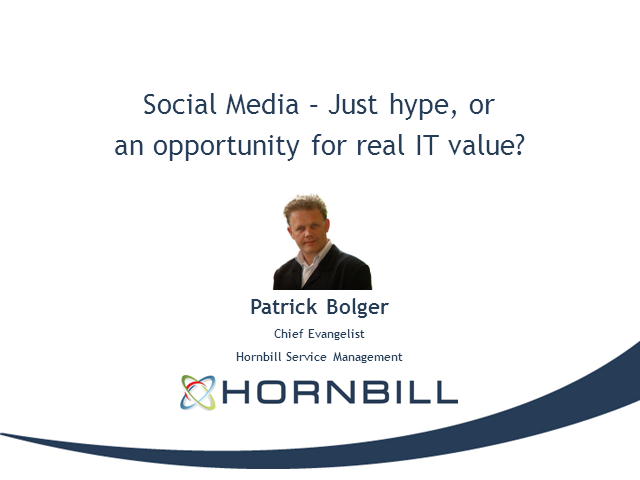 Social Media – Just Hype, or an Opportunity for Real IT Value? It has been described as “the biggest thing since the industrial revolution”, yet some believe that Social Media is for teenagers and has no place in business. This presentation looks at the figures behind the hype and examples of Social Media use in IT and business. Can IT take the driving seat, harness the technology and play a lead role in demonstrating real business value? Title: Social Media – Just Hype, or an Opportunity for Real IT Value?